Excel & Nutrition Manager for use with P90X Now, For all you X’ers and / or soon to be X’ers. Have you used up all your worksheets from round one? Did you buy your videos off of eBay or someplace else and don't have a clue when to do the workouts? Do you want to stay motivated and get some meaning out of your numbers? Take a look at your Excel Workout Manager for the X . This is most innovative and exciting way to manage your Fitness Journey. All you need, besides your "Bring-It" attitude, is Microsoft Excel. in the Green Box and that gets the ball rolling. This beginning date gets sent throughout the program to setup your Worksheets and your Master Schedule. This is where you Enter your Beginning Body Stats. That way you will know how far you have progressed at the end of your 90 day fitness quest. It is easy to complete and only takes a minute or so. Just Enter your info into the Yellow Shaded Blocks and watch as you body fat % is automatically calculated for you. You can also enter your own body fat % number from the body fat calculator page. There you can enter your caliper readings, and the program automatically calculates your body fat %. Or enter your own number from scales or other measuring device. Once that is completed you can then click on the Go To Fit Test Page link and you can complete that page as well. As Before, Just Enter Data into the Yellow Shaded Cells and everything else is automatically calculated for you. At the end of 90 days, you can come back here, and enter your new Fit Test numbers. You can also see view your End of Phase body stat numbers. Plus, You can enter other end of phase measurements if you want to as well (Chest, Thighs & Biceps). This is just one of the many pages where you can view and enter your progress numbers. The Green Blocks below are Yellow to begin with and if you meet or exceed the requirements for that test your block turns green . You're not going to see a Fit Test Page like this one anywhere else. The little Mini-Graph on the Fit Page is a result of user requests, so it is now here. This gives you a cool way to graphically view your Beginning and Ending Numbers. As you can see from the previous screen shots you have clickable Menu Links at the Top of Every Page. There are logically placed links embedded in most pages as well. You can jump from page to page with ease in this program. Sometimes you don't even realize you are using a spreadsheet due to all the clickable links and menu items. Now take a look at your Command Center Page. Your Master Schedule . 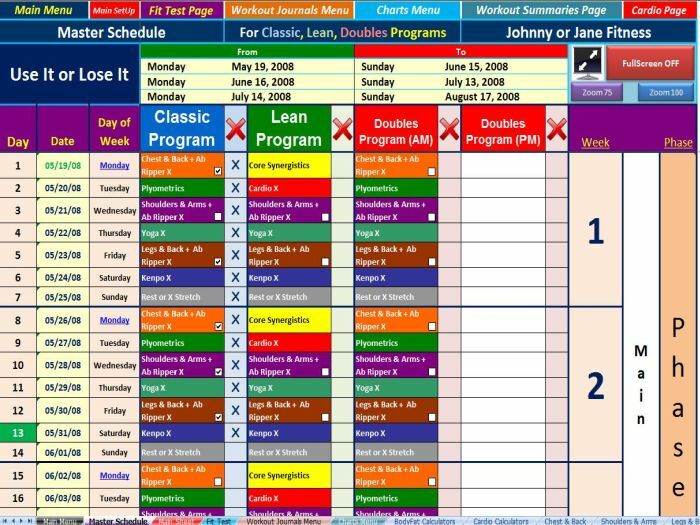 Your Master Schedule is where you can view and manage a nicely color coded layout of all your X Program Workouts. All the workout blocks are clickable links to that particular worksheet. You can jump to anywhere you want to go from this Command Center Page. It includes All 3 Workout Programs, all on ONE PAGE. This program covers all 13 weeks. Beware of programs covering only 12 weeks. It is a 90 day program not 84. Week 13 is just as important as all the other weeks. As you can see, everything is nicely formatted in an easy to use interface. You just click on a workout you want to view or complete, and the program sends you right to it. One click and you can come right back, or go somewhere else in the program. It is color coded for even easier viewing. There are also screen sizing buttons on the page for easier viewing as well. Also, The current day's Day Number is always highlighted in Green for you. When your workouts are completed, you just X them off on your Master Schedule . The small check boxes are to keep track of your completed Ab Ripper X Workouts. It's a good feeling to watch all your X's add up. Here is a screenshot of the worksheet, that your are taken to. As on every page, you have your clickable Menu Links at the Top, as well as page sizing buttons. (Full-Screen, Zoom 75%, Zoom back to 100% screen, and the little monitor with "The End" on the screen turns off the Full-Screen Feature. Full-Screen mode is great because you get to see alot more of the worksheet. The sheet also keeps a weekly track of your main benchmark exercises like Push-Ups and Pull-Ups. You may not see the color/progress shading in Excel versions lower than 2007. You can enter your numbers directly into the worksheet and it is stored there for future reference and graphing. Some X'ers like to record their numbers on their hard copy worksheets during the workout, and when they are recovered, enter their recorded numbers into their Excel Workout Manager for the X. I have quite a few customers who just set their laptops up in their workout area, and when Tony says record it, they just walk over to their laptop, and a couple clicks to enter their numbers, and they are done. Every worksheet shows you a graphic of what Tools are needed for that workout, plus you have room for notes at the bottom of each sheet. For Each workout, where Ab Ripper is next, the link is on the worksheet for you to go right to the correct column and block. Each Main Workout has the link which takes you to the Graph for that Workout as well. Just click on the little monitor with the Graph on it. It is always nice to see a graphical representation of your improving numbers. Here is a screenshot of the Chest & Back workout Chart. Your Excel Workout Manager for the X gives you Advanced Graphing, where you have total control of what data you want to see, and what data you don't want to see. Advanced Graphing with dual scaling. You don't have to enter special calculator numbers for the graphs to look right due to higher numbers from the weight exercises. It will calculate all sets, to include the weights, not just 2nd reps only. Advanced Graphing with Many Ways to Filter. This is the ultimate in one-click control. just click on the exercises you want to see on the graph. You have top and bottom control of clicking individual exercises. They are in sync. You can select whichever ones you want or don't want to view. You also get screen-sizing buttons for easier viewing as well. Here, you just clicked on Burly Marine Guy and it automatically shows nothing but Pull-Ups. No nosediving of the lines if no data exists, as you're going to get with the others. You get Worksheets for ALL the Workouts. What if you need to miss or reschedule a workout? workout date, and the remaining calendar dates automatically recalculate themselves. All the worksheets automatically update their dates as well. What could be easier than that? No certain steps to remember, or special procedure required, as with others. This program allows you to be flexible. Run the 90 days straight, or reschedule as you need to with no worries. Some X'ers just run the 90 days and do the workouts exactly as scheduled. They do the workout scheduled for that day when they can get it in. If they miss, for example, their Plyometrics day, and don't workout until the next day, they do the Shoulders workout. The day they missed doesn't get X'd. The program adds up all the X's and they know how many workouts were done and missed in 90 days. For example, at the end of 90 days the program calculates 82 workouts completed. Then on their next 90 days, they try to better themselves by completing 83 or more workouts in 90 days. Both systems have their Pros and Cons. You could do both methods if you wanted. Miss some, reschedule some, etc. It's that easy. Another great feature of this program, is your weekly Check-Up Pages. Normally, on the morning after your X-Stretch, or Rest Day, you can Enter your Weekly Check-Up Numbers. Enter your Weight, Waist, Hips, and Neck measurements in the Yellow Shaded Cells , and watch as your Body Fat %, Weight Loss, Fat Loss, and Lean Body Mass Numbers are automatically calculated for you. This program includes ALL 13 Weeks of Check Up Pages. You have a side tab, on the form, with clickable links for easy navigation between all the check up pages. is that they have actually lost 21.06 pounds of fat, due to a 7.21 pound increase in lean body mass. links to it go to it and view your weekly body stats progress. It is always nice to see the Lean Body Mass Line go up, and the Fat Weight Line go Down. The other half of the fitness equation is diet and nutrition. (Clean Eating). Included, at No Xtra Charge is your X Program Nutrition Manager. to help you lose fat while maintaining high energy levels. more than one or two steps. lt is definitely better suited to those who don't like to cook and follow recipes. You are provided with 13 weeks of easy to use meal log sheets INCORPORATING THE EASY TO USE PORTION PLAN APPROACH. All the Meal Logs are easily accessible by the Nicely formatted Main Nutrition Calendar. This Main Nutrition Calendar lets you jump to any day's meal log with a single click, and back again with no problem. day's easy to use Meal Log. You can Also Jump to any of the Meal Plans to view those as well. Plus you get a Nutrition Guide Summary Page. The Next Screenshot is of the easy to use Meal Log. Then, Just place X'S or ANY CHARACTER in the above easy to use Food Journal.As you enter your consumed portions, watch as the program automatically counts your consumed portions, and automatically calculates your calories. This is an easy way to let you know if you are on staying on track. I use a 1-2 letter system, and I can easily get a quick look at what i ate for that Day. ie, F for Fish, C for Chicken, GB for Green Beans, E for an Egg, EW for egg whites, T for Tuna, B for bread in the veggies row, B for Banana in the Fruit row, TJ for Turkey Jerky, CC for Cottage Cheese, etc. You can use any Letter system you want to use that has meaning for you. If some of the letters are bad, ie BC for Birthday Cake, you could right notes on how clean your other meal choices were that day. If all other foods were clean, you could probably give yourself a B or B-. Looks pretty simple to me. Just a Few Key Strokes and that's it. Your program also keeps track of your water if you want. The total ounces block turns green when you meet the minimum requirements mentioned in the nutrition guide. There is a link on every meal journal for that weeks Portion Summaries. You not only get a daily record of your nutrition, but a weekly snapshot as well. You get all 13 weeks of Nutrition Summaries. As you can see, you get a nice report of how your week went on the portion plan. And Yes, the underlined dates are clickable links to the Meal Logs for that week, plus all the usual links for easy navigation. +++++ Also Included is A Daily Calories Summary Report to compare actual calories with your target calories. YOU GET A NICE CHART TO VIEW YOUR ACTUAL CALORIES VS. YOUR TARGET CALORIES. I know I haven't filled you in on all the features of this program. You're probably pretty tired reading all this. As you can see, from the description above, and all the screenshots, you get quite a lot for only $9.95. You get 2 Programs/Files for the Price of One. MANY MORE SCREENSHOTS SHOWN BELOW IN EBAY PICTURE MANAGER. I created this program template with MS Excel 2007 and saved it as a 97-2003 template file which most people have. However, this is no mere template. All the pages are interlocked together via menus and links for easy navigating. Save yourself any spreadsheet creation headaches and Wasted Hours because I have done it all for you. The file Works with Windows MS Excel 2000-2007. THE PROGRAM DOES CONTAIN MACROS AND VISUAL BASIC CODE. IF YOU HAVE A MAC, AND WANT TO TRY, THAT IS FINE. IF IT DOESN'T WORK, YOU CAN GET A REFUND. ***** Not Recommended for Excel 97 customers due to all the graphics, and and the thousands of cell formats. ****** Update. Not Recommended for MAC Excel 2008 users either. Just check out all the screenshots, and if this is something you can use I will provide any support you need. (Due to different versions of Excel, Monitor Sizes, Resolution Settings, and Graphic Cards, the screen colors and screen fit, may not Be exactly as shown. What you see is how it looks on my screen. This gives you an idea of what is included in the program and what it looks like. If you ever lose or accidentally mess up a template, just let me know and I will send you another one. use by your immediate family. I have no problem referring you to another seller if my program doesn't fit your needs, and I have done so. I have talked to people on the phone, via email in helping them if they have questions or problems. Feel free to email if you have questions. If not happy, let me know, and I will refund your money. Access to the programs, will be sent to you no later than 10 hrs after payment is received. If you don't get it within that time frame, email me right away. Quite often, in the evenings, I am able to send within minutes of purchase. Thanks a lot and get ripped with the X.